HomeWorldA Film Has Inflamed Indians. But Moviegoers Mostly Say It’s Fine. January 25, 2018 Paul World Comments Off on A Film Has Inflamed Indians. But Moviegoers Mostly Say It’s Fine. The controversy goes back to the 14th century — or 16th century, depending on who you ask. In 1540, the Sufi poet Malik Muhammad Jayasi wrote the epic “Padmavat” about a Hindu queen, Padmavati, so beautiful that a Muslim ruler besieges her entire kingdom to have her. Instead of submitting, Padmavati kills herself. The story was set in a Rajput kingdom in Rajasthan, in northwestern India, around 1302. But whether Padmavati actually existed is a big question. Scholars who have studied that era say they have found historical references to the Muslim ruler and the Hindu king in Jayasi’s epic — but no mention of Padmavati or a queen so beautiful that her looks started a war. 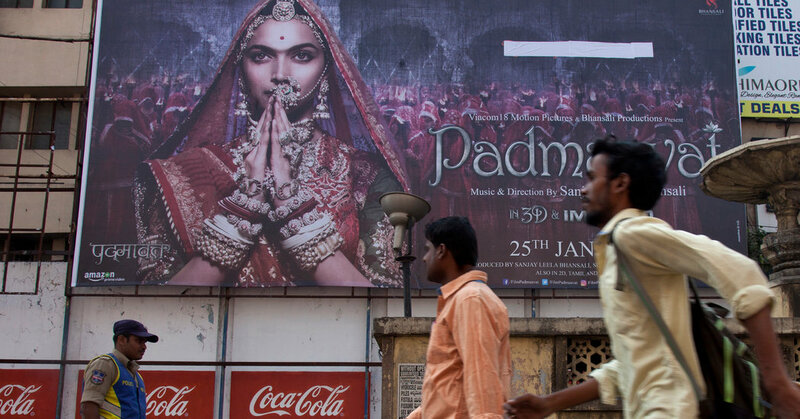 That hasn’t stopped Rajput and Hindu extremists from turning “Padmaavat” into a rallying cry. Without even seeing the film, several Rajput activists complained that Padmavati’s clothes were too skimpy; a dream sequence between her and the Muslim invader was inappropriate; and the heroism of their revered queen had been cheapened. They attacked the crew of the film while it was in production and offered a bounty to behead the lead actress and director. They also threatened to cut off the actress’s nose. For weeks, anxiety over the film and a debate on artistic license has dominated Indian headlines and put the public on edge. Police officials around the country have been busing in reinforcements, and on Thursday, many cinemas were ringed by packs of officers wielding long wooden sticks, just in case there was trouble. Several schools closed on Thursday as a precaution. The day before, an angry mob of “Padmaavat” protesters, one of many across northern India, stoned a school bus full of children near New Delhi. No one was seriously hurt but video of the episode went viral, adding to the fears. On Thursday, the worst movie-related violence seemed to have erupted in Bihar, a poor state in northern India, where bands of angry young men attacked a theater, tore up posters and vandalized vehicles. Indian film critics weren’t much kinder. One called it “so superficial’’ and a “slog,” giving it two stars out of five. Still, “Padmaavat” had “taken an excellent opening,” according to a website that tracks box-office sales. In fact, in some places, the controversy might have even helped it gain an audience. “I was curious to see the movie because it was making lots of noise,” said K. C. Sharma, a retired army officer, who saw the movie at a theater in a mall near New Delhi.